I received a press release from Free Muse, an organization that advocates freedom of expression for musicians and composers worldwide, on 16 February 2012. The news release was about the legal opinion of the UN working Group on Arbitrary Detention in the case of Pierre Roger Lambo Sandjo, commonly known as Lapiro de Mbanga - a Cameroonian musician who was arrested, tried and imprisoned for 3 years in 2008. 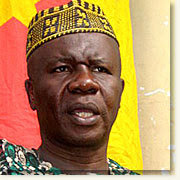 Lapiro de Mbanga was arrested on 9 April 2008 following a mass demonstration in Cameroon. According to Free Muse, he was arrested for singing a song that criticized a controversial Constitutional amendment that eliminated presidential term limits and granted the Head of State immunity for crimes committed in office. According to information communicated to the UN Working group, Lapiro was arrested on accusations of mass looting, destruction of public property, obstruction of public way, attack on public property and participating in illegal meetings. On 24 September 2008, he was condemned - after what was widely seen as a "political trial" - to 3 years in prison for participating in illegal meetings, obstruction of public way and mass looting. [Source]. Despite condemnation by rights groups and campaigns to secure his release, the artist served 3 years in the infamous New Bell Prison in Douala. The prison, according to Amnesty International, has an official capacity of 700 but held 2,453 inmates in August 2011. [Source]. Lapiro was released on 8 April 2011. This is a very long list of violations suffered by one man in the hands of his government. The UN Working Group urged the government of Cameroon to compensate Lapiro for damages suffered as a result of his arbitrary arrest and detention, grant him amnesty or pardon and take measures to guarantee his right to security of person. The opinion and recommendations (in French) of the UN Working Group is dated 1 September 2011. The government of Cameroon must respect its obligations under international law and fulfill the demands of the Working Group on Arbitrary Detention. The authorities are obliged to ensure that people, including musicians, journalists, peaceful protesters or ordinary citizens, are not arbitrarily arrested or subjected to torture, cruel, inhuman or degrading treatment or punishment. ASIDE: FreeMuse interviewed Lapiro de Mbanga on 8 May 2011 - one month after his release from New Bell Prison. Watch the video interview. It is worth mentioning that Lapiro is French-speaking.